During a break in Kentucky’s dismantling of Alabama on the hardwood Saturday, announcer Kara Lawson noted that the movie “Selma” was playing in theaters around Tuscaloosa, as it was in theaters across the country. “We can’t forget the image of Governor George Wallace at the Alabama campus, standing in the school doorway, denying entrance to African American students,” she said, invoking the spirit of Martin Luther King on the weekend of his holiday. 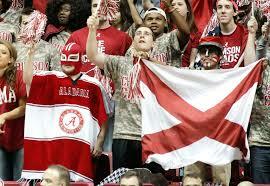 The colorful Alabama contingent: At least it wasn’t white sheets. No, we can’t. Thank you Kara for bringing a little reality to this college game, my favorite game, on this important holiday weekend. There is an important back story about these young men, these students and dreamers who play this game at such extraordinary levels. In this game, as in many other college games across the country, they are almost all African Americans, and they are living the Martin Luther King dream as fully as anyone who strives to achieve in our society. Kentucky has nine McDonald’s High School All-Americans, half just out of high school, almost all on the threshold of becoming millionaires. I hedge that bet, since I don’t know who among them will not make millions playing basketball, here or abroad. The record suggests that none will fail. Basketball truly is an international game nowadays, and many of the most talented, skilled white players come from Europe. But in the college game, African Americans still dominate. The fact that they are the heart and soul of Kentucky, the winningest team in college basketball history, and perhaps fielding the greatest team ever with this 2014-15 group, is a testament to how far we have come in the past 40 years. As a native Kentuckian, I am keenly aware of the ugly legacy of racism that accompanies the fabulous basketball tradition of my home state, and particularly its university. Adolph Rupp was one of the greatest basketball coaches of all time, but the evidence suggests that he did not seriously recruit the great black players – some of whom were Kentucky schoolboys. Was he a racist? Well, he was not doing the right thing. I remember, as a high school senior working the sports slot at my hometown newspaper, the Henderson Gleaner, in March 1966, listening (only radio back then) in disbelief as Kentucky fell to Texas Western for the NCAA title. It was insane, Pat Riley and Louie Dampier and Larry Conley and that whole cast of brilliant Rupp’s Runts, losing to a bunch of unknown black players from a minor school in Texas. Rupp had made half-hearted overtures to Clem Haskins (1963), Wes Unseld (1964), Michael Redd (1963) and Butch Beard (1965), all great Kentucky high school players who happened to be black. Now, in 1967, the year after being dispatched by an all-black starting five in Texas Western, Rupp had a chance to make amends, and to face reality. Instead, in a year in which Kentucky schoolboys included 7-foot center Jim McDaniels and fellow African-American hotshots Jim Rose, Clarence Glover and Jerome Perry, Rupp whiffed. All those players ended up at Western Kentucky University, which beat Kentucky, 107-83, in the 1971 NCAA regional finals and finished third overall in the tournament that year. Rupp retired in 1972 and Kentucky basketball hasn’t been the same since, except for the winning. Joe B Hall recruited two great black players from Lexington, Jack Givens and James Lee, in 1974, and the two led the Wildcats to the NCAA championship in 1978. Kentucky has won eight NCAA championships, second only UCLA’s 11, the remarkable record of the Wizard of Westwood, Coach John Wooden, another Hoosier refugee. 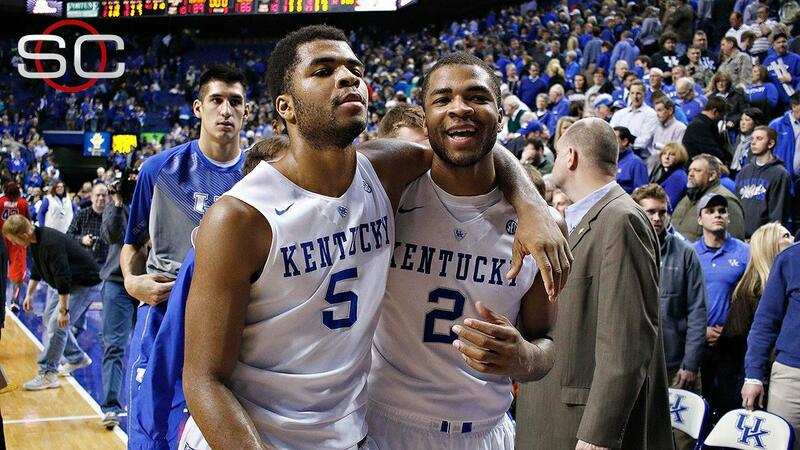 This year Kentucky could have No. 9 in its sights. If you haven’t already bet on Kentucky to win it all, sorry, it’s too late. The Wildcats are the prohibitive favorites. They feature two teams, actually, each of which could play in the NBA, and will play in the NBA. Six of these players came back from last year’s national championship game, rather than going on to play in the NBA, including the twin guards, Andrew and Aaron Harrison, at 6-6 bigger than a lot of front-court players they’re playing. The Harrison twins, Andrew and Aaron, tower over opposing guards. Willie Cauley-Stein is a 7-foot defensive demon who is an NBA lottery pick even without a legitimate offensive game. Karl Anthony Towns is a skilled 6-11 freshman center who may be the second player picked in the NBA draft this year. Trey Lyles, the smooth 6-10 freshman from Indianapolis, completes the first team, the White platoon. They are imposing, to say the least, from 6-6 to 7-foot. And there is a second platoon, the Blue team, that features 5-11 sparkplug Tyler Ulis and 6-6 shooting phenom Devin Booker, who leads the team in scoring. Dakari Johnson is a 7-footer with muscle who pounds the ball inside. And 6-10 Marcus Lee is a shot-blocking machine. Kentucky’s most athletic player, Alex Poythress, suffered a season-ending knee injury early in the campaign, but that has made room for Kentucky’s high school Mr. Basketball Dominique Hawkins, now a sophomore. This is a bunch of individual high achievers, playing like one smooth machine, in large measure thanks to Coach John Calipari, the maestro of the “one-and-done.” Yes, they’re all African Americans, and they’re the best of the best. And they’ve all come together to sacrifice for a common goal, to win a championship, playing together as a team. I don’t see the Wildcats losing a game this season, and I have decidedly mixed emotions about that. In another of my graduating years, 1976 at Indiana University, one of the greatest college basketball teams of all time finished undefeated, 32-0. The previous year, the Hoosiers had only lost one game – to Kentucky in the NCAA regional finals. That was a team – with Quinn Buckner, Scott May, Kent Benson, Bobby Wilkerson, Tom Abernethy and John Laskowski – that played together flawlessly. No team has gone undefeated since. I believe they’ve met their match with this Kentucky team. Just look at the stats. The Wildcats are choking other teams, setting defensive records, leading the nation in multiple categories. Even the two overtime victories during the SEC season show their resilience more than vulnerability. I believe Dr. King would be proud of this advancement too, that Kentucky may be a little more color blind today because of the preeminence of African-American heroes. Whether it’s sports or cinema or business or politics, black leaders are assuming their roles in our society, and that is good for everyone. Take Kara Lawson, for example, our sports narrator during the Kentucky-Alabama game. Kara is an African American woman who rose to stardom playing basketball in my neighborhood, at West Springfield High School in Fairfax, Va., while I was coaching my daughters in a neighborhood league. She went on to star at the University of Tennessee for the great coach, Pat Summitt, and on to a WNBA championship and an Olympic gold medal. She may be the best basketball commentator on television today, able to reflect on the messages of our times as well as the plays of the game. But her most important role may be leading my Washington Mystics back to the WNBA playoffs this season. I’m counting on her.